We hope everyone had a great Easter weekend! And we have big news – Invitations went out last week! We’ve received word that they’ve reached as far as Michigan already, so hopefully most everyone has gotten theirs by now. The invitations were custom-designed by Dolce Design; these are the invites we won at the silent auction at Get Hitched, Give Hope last year. We have to say, they’re quite amazing! Clean, simple, and classy, with a retro/deco feel – they totally fit that Mad Men/”Swanky Elegance” theme we’re planning. 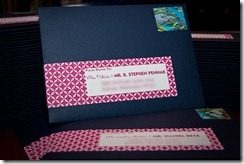 We won’t post pictures of the actual invites here – we want that to be a surprise for you when you get them in the mail! But take a look to the right and you’ll see a whole batch of them all ready to mail. As with our Save The Dates, we hand made the wraparound address labels. 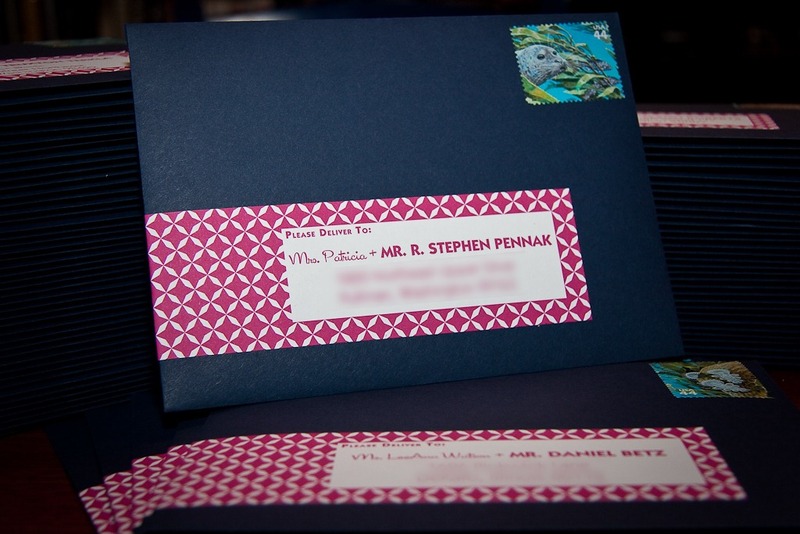 This time we kicked it up a notch, using our theme fonts, the same as on the actual invitations, and the background matches the berry-colored envelope liner. See… now you know a little bit of what the invitations look like :) A while back we saw a blog post by another couple who had separate male and female theme fonts, and we loved that idea, so you’ll see that used throughout all of the paper products from now until the wedding. Call us geeks or over-planners or whatever, but we think it adds a neat extra touch that ties everything together :) We’re still planning a future post that will share our label templates for anyone that wants to do your own fantastic labels – look for that in the next couple of weeks! So anyway, those are our invitations! Don’t forget to RSVP by May 1st! 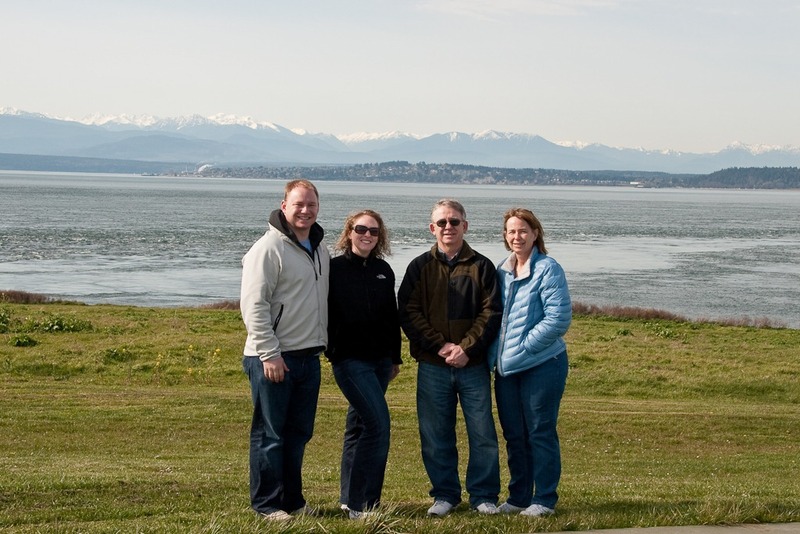 We’ll leave you with a fun photo of us out on Whidbey Island from a few weeks ago when we had Ben’s parents visit – it was a beautiful day to drive around Western Washington and take in the views of the ocean with the mountains in the distance. 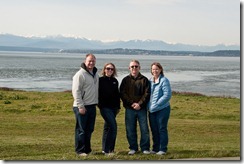 This is at Fort Casey, which looked to me like a great location for filming “24” (sadly, it’s been cancelled after this season, so that’ll never happen). Views like this are just one of the things everyone who’s never been to Seattle can look forward to in May! BTW, we also visited Deception Pass State Park on our adventurous drive – check out all the pictures on Ben’s Flickr page.